Frog Watch in Victoria is a highly successful community frog conservation program that originated as a joint project between the Amphibian Research Centre and Alcoa World Alumina Australia. Its mission is to give Victorians the opportunity to help conserve frog life in their local area. Frog Watch aims to involve a large number of Victorians of all ages in actively helping to increase the quality of large-scale frog habitat in Victoria. Helping our frog population will also help bird and insect habitat and aims to get more people interested in overall conservation of our environment. Get your free copy of the booklet "Bonking in the Garden" now! 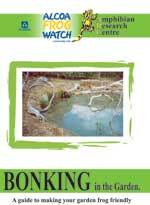 "Bonking in the Garden" is the Frog Watch publication that collects the key information from the Frog-friendly section of this website. You can download the booklet in Adobe Acrobat PDF format for easy printing. Find out more in the frog-friendly gardening section. Information on pond-building, plant selection, and more are continually being developed and are stored on this website for download by participants. Or you can just read the information on the website at your leisure. Urban frog rehabilitation is most effective where local communities work together to build frog habitat at a diversity of scales - from individual frog-friendly gardens through to larger ponds and watercourses designed to offer suitable frog breeding habitats. You too could have a frog paradise in your backyard. People wanting to build frog-friendly habitat can see how best to go about it by visiting demonstration sites, several of which have been made already including Parks Victoria's Serendip Sanctuary, Pearcedale Conservation Park, and a third in Portland. Frog Watch holds field days around rural Victoria, showing Landcare groups, schools and community groups how to build frog-friendly gardens, ponds and farm dams.